"That's right, we said it - and we're not taking it back. The iPhone may be the greatest handheld surfing device ever to rock the mobile Web, and a fabulous media player to boot. It may be the highest-rated mobile phone on CNET UK, rocking the pockets of half of our crack editorial team. It's certainly the touchscreen face that launched a thousand apps. But as an actual call-making phone, it's rubbish, and we aim to prove it." Apple has introduced new Apple TV 3.0 software featuring a redesigned main menu that makes navigating your favorite content simpler and faster, and makes enjoying the largest selection of on-demand HD movie rentals and purchases, HD TV shows, music and podcasts from the iTunes Store even better on your TV. You can now enjoy iTunes Extras and iTunes LP in stunning fullscreen with your Apple TV, as well as listen to Genius Mixes and Internet radio through your home theater system. The new Apple TV software is available immediately free of charge to existing Apple TV owners, and Apple TV with 160 GB capacity is available for $229. Apple TV users have direct access to a catalog of over 8,000 Hollywood films on iTunes including over 2,000 in stunning HD video available for rent or purchase. Users can also choose from a selection of 11 million songs, 10,000 music videos and over 50,000 TV episodes to purchase directly from their Apple TV or browse and enjoy the iTunes Store podcast directory of over 175,000 free video and audio podcasts. Purchases downloaded to Apple TV are automatically synched back to iTunes on the user's computer for enjoyment on their Mac or PC or all current generation iPods or iPhones. * iPod touch or iPhone users can download the free Remote app from the App Store to control their Apple TV with a simple tap or flick of the finger. The new Apple TV software is available as a free automatic download to all Apple TV customers. The 160 GB Apple TV is available from the Apple Store , Apple's retail stores, and Apple Authorized Resellers for a suggested retail price of $229. Apple TV requires an 802.11b/g/n wireless network or 10/100 Base-T Ethernet networking, a broadband Internet connection and a high definition widescreen TV. Video availability varies by country. Apple TV easily connects to a broad range of widescreen TVs and home theater systems and comes standard with HDMI, component video, analog and optical audio ports. Using high-speed WiFi, Apple TV automatically plays your iTunes content without setup or management. *Movie rentals work on iPod classic, iPod nano with video, iPod touch, iPhone, iPhone 3G and iPhone 3GS. Editor's note: See Low End Mac's Best Apple TV Deals for current prices. PR: iTunes is a free application for Mac and PC. It plays all your digital music and video. It synchs content to your iPod, iPhone, and Apple TV. And you can add to your collection anytime, 24/7. Organize and play everything on your Mac or PC. Then sync it to your iPod and bring it along. Anywhere. Adds support for Apple TV software version 3.0, adds an option for a dark background for Grid View, and improves support for accessibility. PR: iLounge debuts the brand-new 2010 iPod + iPhone Buyers' Guide, the latest in its multi-million-downloaded series of publications. The 200-page Guide is available immediately as a free, hassle-free download from iLounge, and will be featured at the iLounge Pavilion of the January 2010 International Consumer Electronics Show in Las Vegas. Authoritative. Comprehensive. Incredible. These are the words that readers use to describe iLounge's annual iPod iPhone Buyers' Guides - respected annual overviews of Apple's portable media devices and third-party add-ons. Today, iLounge proudly debuts the brand-new 2010 iPod + iPhone Buyers' Guide, the latest in its multi-million-downloaded series of publications. The 200-page Guide is available immediately as a free, hassle-free download from iLounge, and will be featured at the iLounge Pavilion of the January 2010 International Consumer Electronics Show in Las Vegas. With thousands of accessories and "apps" now competing for attention, this is the most exciting time in history to buy iPods, iPhones, and add-ons, but also the most confusing. As the world's leading reviewer of these products since 2001, iLounge has distilled years of honest, smart analysis into the 2010 Guide, creating four easy-to-read sections that spotlight the year's most essential products: Apple hardware, games, applications, and accessories. New headphones, speakers, cases, batteries, and car accessories receive special attention inside. Serious iPod and iPhone fans will enjoy exclusive sneak peeks at upcoming accessories, as well as gift recommendations that range from free games to a $41,000 platinum and diamond-encrusted iPhone 3GS - plus plenty of affordable choices in the middle. First-time users will especially appreciate the iGlossary, which clearly explains all the Apple technical jargon that has become common over the last several years, and a Where To Buy section, which clearly shows the lowest-priced and smartest places to purchase iPods, iPhones, and accessories. "Apple has sold over 260 million iPods and iPhones," said Jeremy Horwitz, Editor-in-Chief of iLounge and the Guide, "so there's never been a greater appetite for honest information about these devices and their add-ons. The 2010 Buyers' Guide is a quick, downloadable summary you can read on your computer or carry in your pocket when shopping, helping you make educated choices about what best fits your needs." Buying and Selling Tips: Looking to buy a new iPod or iPhone right now? Skip the screwy 2009 iPod shuffle, and try the tricked-out new iPod touch, iPod nano, or iPhone 3GS. Want to sell your old model? Check the Guide for current used pricing for every iPod and iPhone released since 2001. Best of the Year and Readers' Choice Awards: Sixteen products and three top developers are named as winners of iLounge's prestigious Best of the Year awards for 2009, with highest honors going to Speck Products, iHome, Gameloft, Facebook, and SwitchEasy. Thousands of reader votes selected the winners of four Readers' Choice Awards, as well. The Complete History of iPod, iPhone iTunes: Over 54 million iPods and 20 million iPhones were sold in the past year, along with roughly one billion App Store downloads. Our milestone-based timeline covers everything from the January 2001 release of iTunes through October 2009's release of Apple TV 3.0. Contests: With over $2,300 in prizes at stake, winners of iLounge's Design The Apple Tablet art contest are named, and a new iD the iPods + iPhones photo contest debuts. "With two million downloads of our Guides in the last year alone, iLounge has built an unmatched reputation for honest and objective coverage of Apple's digital media products," said Dennis Lloyd, Publisher of iLounge. "Our latest 2010 Buyers' Guide is a must-read for anyone who has an iPod or iPhone, and anyone who's thinking of buying Apple-related products this year." The 2010 iPod + iPhone Buyers' Guide is available now in Adobe PDF format. Widely heralded as "the iPod Bible," iLounge's popular tutorial edition, The Free iPod + iPhone Book, and previous years' versions of the Buyers' Guide can also be downloaded from the iLounge online. PR: Following the huge success of the 99¢ Recession Case made out of cardboard, case-mate is holding a photo contest where participants will have to add their own artistic twist to the case, take a picture, and upload it. The picture with the most votes receives the Grand Prize, a super sweet 1982 Suzuki FA50 moped, and runners up get a shopping spree in the case-mate store. Also, if 99¢ is too much money, plans for building the case for free are available to download on the case-mate recession case contest site. "Walt Disney World Guide" Notescast - A complete guide to Walt Disney World Resort - 230 Pages with photos. "Walt Disney World Secrets" Notescast - A revealing tour of the little known secrets throughout Walt Disney World® Resort. "The Adventures of Tom Sawyer" Notescast - This classic American tale now on the iPod classic, iPod video and iPod nano. "Top 10 Yosemite Hikes" Notescast - A guide to the Top 10 hikes of Yosemite National Park - Complete with photos. "Pride and Prejudice" Notescast - One of the most popular novels of all time . . . now on the iPod. - 240 Pages. In addition, with the iPod's installed base of over 100 million users across all demographics worldwide, major brands, including Hilton Hotels, Sheraton, DoubleTree and others are now looking to TimeStream Software to develop custom Notescasts as powerful new mobile marketing tools, a idea the Mobile Marketing Association calls "A groundbreaking concept." "We're excited to introduce an all new use for the iPod." said Mike Westby of TimeStream Software. "The fact that nearly every iPod in use worldwide today is already configured to install Notescasts is obviously a big plus for distribution of our product and new mobile marketing tool." A growing list of Notescast titles are available for free and for sale at the Notescast web site. PR: Dusseldorf-based Hot Chili Apps GmbH announces C@rds Master 1.1.2, an update to their free mobile eCard utility for iPhone and iPod touch. Designed specifically to take advantage of the iPhone's unique capabilities and interface, C@rds Master is an easy-to-use yet sophisticated postcard creation and delivery tool. 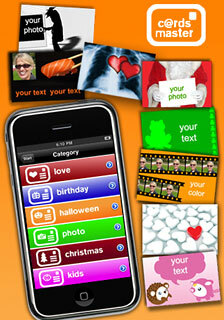 C@rds sets includes 10 topics for nearly every occasion to create and generate individual and fancy digital postcards. Hot Chili Apps GmbH announces C@rds Master 1.1.2, an update to their free mobile eCard utility for iPhone and iPod touch. Designed specifically to take advantage of the iPhone's unique capabilities and interface, C@rds Master is an easy-to-use yet sophisticated postcard creation and delivery tool. C@rds Master offers countless choices for every occasion to surprise loved ones, friends, colleagues, partners and family with fancy mobile digital postcards. C@rds Master features sets offering 10 topics for nearly every occasion, including, Love, Birthday, Photos, Dating, Christmas, Easter, Halloween, Kids, Frames, as well as for Moving/Relocation. Two stylish cards per set, including 20 c@rds templates in all, and can be used immediately. By taking advantage of C@rds' convenient in-app purchase, users can choose from a list of 400 additional template sets for purchase and downloading directly into the application. All downloaded sets remain in the application so they can be used at any time. "With the new possibilities that Apple offered by using InAppPurchase also in free Apps now everyone can easily get to know our cards," said Farid Zendagui, CEO of Hot Chili Apps. "The positive feedback we have received after a short time confirms the success of the concept." With a focus on ease-of-use, the application offers Landscape view for creating and previewing postcards. Users can use any font available from the iPhone/iPod device for text, choose background, as well as preferred effects for photos: black and white and sepia shadow. C@rds can be sent directly from the application to the device's photo album, emailed to family and friends, and even shared on Facebook, Twitter, or tumblr. C@rds Master 1.1.2 is completely free (Regular $1.99) and available now worldwide exclusively through the App Store in the Utilities category. Card sets are half priced. As a very special occasion to get to know Hot Chili Apps digital C@rds, Users can try two topics of every item for free and get every template for half price. "A wide range of different iPhone apps are available for reading news - whether via RSS, or another method. Today I'm taking a look at Broadersheet, a $3.99 iPhone application that aims to be your portable electronic newspaper, aggregating the content that interests you most from a range of different sources. "A few features make it stand out from the crowd: it's intelligent, and learns which stories interest you most as you rate them, you can read stories offline, and also view a simplified version of a website - optimised for the iPhone's screen. "I'll be looking at these features in greater detail, and assessing whether it's a good solution for reading news on-the-go." PR: My Christmas gift list is the latest ultimate application specially designed to help you organize your Christmas shopping. This shopping list manager is the perfect tool to take care of all your shopping for the Holiday season: starting from contacts, budget to ideas and gifts, organize your Christmas shopping in the most efficient and enjoyable way. Black Friday is coming, so get yourself My Christmas Gift List and get all your Christmas gifts on time! Localization of the application: English, French, German, Spanish, Portuguese, Italian, Dutch, Czech, and Polish. Create a fully editable list of contacts with an efficient management thanks to several categories: family, friends, colleagues, other/none. Import contacts from your Apple AddressBook or add a person from an empty contact. Modify all your contacts and change their characteristics as often as necessary (name, category, allocated budget). Use of the Photo Library for each contact. Change and reorganize the the order of each contact in your list. For each contact, reminder of the status of the gifts, total budget set and a check mark to notify when all gifts are bought. Christmas countdown and a general reminder of shopping information: number of contacts in the list, budget spent, gift already bought. Instant Shopping List: accessible shopping list always updated will your latest changes. Check mark in front of each item of the list, synchronization with the budget and the countdown of gifts already bought. Fully editable list of gifts: status, budget. Synchronization with the shopping list and the general reminder of the shopping information. Use of the Photo Library for each gift's description. What's new in My Christmas Gift List 1.0.1? PR: Energize Software releases an update to the multi-game app "Christmas Experience" with new features. 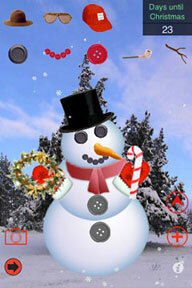 While listening to holiday music you can decorate a snowman, play Christmas hangman, solve a puzzle, and tilt your device in one of eight directions to hear different holiday sounds on the iPhone or iPod touch. Christmas Experience 1.2 is 99¢ and is available exclusively through the iTunes App Store in the Entertainment category. Complete details can be viewed at the Energize Software site. PR: Joy Entertainment LLC, in partnership with iPhone application developer Big Nerd Ranch, Inc., today introduced the first iPhone application of it's kind that allows users to generate musical riffs with their own instruments via the iPhone/iPod touch. Riff Raters was created to allow musicians and music enthusiasts alike to share their original riffs with the world. "Riff Raters enables musicians to spread the news about their music and expand their fan base", says Joy Glenwright, CEO of Joy Entertainment LLC. Musicians can share and get comments about their riffs with the entire App community. Riffs are "short repeated melodic phrases," usually lasting no more than twenty seconds - like a musical "tweet". Musicians can record original riffs on their iPhone/iTouch with any instrument through the Riff Raters application. They can then edit riffs with reverb and trimming tools, ensuring they get the exact sound they want. Once they're done, they post the original riff to Riff Raters and watch it climb to the Top 25 charts. Musicians can even use geo-tagging to let others know where exactly they are in the world. Even if you don't have an instrument to record a riff on Riff Raters, users can rate and comment on the riffs they hear, browsing by instrument, genre or musician. And as riffs become more popular, they rise up the charts. Fans even have the opportunity to be notified when their favorite riffers upload new riffs. Gautam Godse, Software Director of Big Nerd Ranch, Inc., on Riff Raters, "The iPhone is fast approaching 100,000 applications, with music applications numbering in the thousands. This application is unlike anything on the market and we believe it will quickly become one of the most popular musical apps in the entire iTunes store." It is as easy as Riff. Record. Share. Riff Raters is available for only $1.99 in the iTunes App Store. PR: After bringing onto the iPhone the cook book Artusi, Dreams&Lotto, Forex Alert and other successful applications, Intermundia, a leading company in mobile communication, web design and web-marketing, today announce the Opera project. Lovers and novice of the Opera will have the chance to download from iTunes 24 applications with the librettos of the most famous and well known Operas. Aside from the 24 applications, a single application, Opera Top Collection, with the complete collection will be available. Verdi, Mozart, Puccini, Bizet, Rossini, and many others will travel with you always. Thanks to the function read and listen you read along while you listen to an opera on your iPhone while on iPod mode. In this way you can use the application and read the libretto at the same time. The application includes information about the plot, characters and history. The original libretto is readable in the original language, English, and a bilingual version (original and English at the same time) with user-controllable speed and smooth scrolling. The graphics on black background were made especially for use it in the theatre without annoying your peers and opera neighbours. List of the opera applications: Aida (G. Verdi), Carmen (G. Bizet), Carmina Burana (C. Orff), Cavalleria Rusticana (P. Mascagni), Cos fan tutte (W.A. Mozart), Don Giovanni (W.A. Mozart), Il Barbiere di Siviglia (G. Rossini), Il Trovatore (G. Verdi), I Pagliacci (R. Leoncavallo), La Bohme (G. Puccini), La Forza del Destino (G. Verdi), La Traviata (G. Verdi), L Italiana in Algeri (G. Rossini), Le Nozze di Figaro (W.A. Mozart), Lucia di Lammermoor (G. Donizetti), Macbeth (G. Verdi), Madama Butterfly (G. Puccini), Nabucco (G. Verdi), Norma (V. Bellini), Otello (G. Verdi), Requiem (W.A. Mozart), Rigoletto (G. Verdi), Tosca (G. Puccini), Turandot (G. Puccini). PR: AutoRevo, the premier provider of auto dealer websites and on-demand software for automotive dealerships marketing and selling cars online, today announced the release of AutoRevo Mobile, an application that allows dealers to manage their inventory on their iPhone. "The technical barriers to a true mobile solution for dealers have now been removed with the latest iPhone. This is a great opportunity for our industry to flourish with a drastically increased speed of business," said Chad Polk, CEO of AutoRevo. AutoRevo Mobile allows dealers to decode a VIN from a photo of the VIN barcode, edit vehicle information, update prices, shoot and upload unlimited photos, run Carfax Vehicle History Reports, and manage leads, giving dealers the ability to manage their inventory from anywhere, at any time. "We had several dealers buy out their existing contract and upgrade to the iPhone in order to be an early adopter of AutoRevo Mobile," continued Polk. "That tells me we have a game changing product that will move the industry forward. You can literally have a car advertised on your site before the ink dries on the bank draft." A leader in the automotive industry, AutoRevo is a premier provider of dealer websites and on-demand software for automotive dealerships marketing and selling cars online. FastLot, the company's Internet marketing platform, delivers dealer websites, integration with any automotive shopping site, real-time inventory pricing tools, lead management, digital customer delivery documents, advanced reporting and much more. Headquartered in Dallas, Texas, AutoRevo was founded in 2003 and has experienced triple-digit growth for the past six years. The company is aligned with the auto industry's leading e-commerce sites, including: eBay Motors, AutoTrader.com, OVE.com, Openlane.com, Cars.com, Craigslist, Google, Vehix, CARFAX, and hundreds more. Logos Bible Software has announced the release of Logos 4, the newest version of its popular Bible study software. More than three years in development, Logos 4 represents the new standard in digital Bible study. "When we sat down to design Logos 4, we knew it couldn't be just another upgrade to the previous version," said Bob Pritchett, President of Logos Bible Software. "Logos 4 is a complete re-imagining of what a desktop biblical study library ought to be." An advanced search system that can return library-wide searches in less than 1 second. A Smart searching that suggests synonyms and alternate terms. Synchronization "to the cloud" for backup and to keep preferences, notes, reading plans, and your library in sync across all your computers, including PCs, Macs, and iPhones. A smart tab and window management system for workspace customization and multi-monitor support. The Cited By tool, which returns the books from your library that cite the material in your active window. 60 new high-resolution maps of the biblical world. A custom-built index of all the places mentioned in the Bible. A one-of-a-kind family tree diagram for every person mentioned in the Bible. A database of every thing in the Bible (like altars, fig trees, or Goliath's sword), with cross references, pictures, and links to dictionary articles. PR: IvySkin has announced the SmartCase, a new iPhone 3G/3GS accessory that brings a premium power and protection experience to iPhone owners. It offers IvySkin's newest Glass Touch-Thru case called Quattro-T4 bundled with the new Quattro battery. This advanced power distribution system enables the iPhone to receive an additional 200% battery life. The SmartCase includes the SmartPac, Quattro-T4, USB cable and full manufacturer's warranty. The SmartCase is a new iPhone 3G/3GS accessory by IvySkin that brings a premium power and protection experience to iPhone's owners. It offers ivyskin's newest Glass Touch-Thru case called Quattro-T4 bundled with the new Quattro battery. Although there are a few companies that offer an extended battery for the iPhone, none offers one as part of a case that is also fully removable. With the introduction of the world's first Xylo touch-thru case for iPhone, and recently a breakthrough Glass Quattro Touch-Thru cases; It's time to introduce the world's first SmartCase. iPhone 3G/3GS no longer have to sacrifice performance in one area to achieve it in another. With the new SmartCase, iPhone enthusiasts at every level can enjoy a premium protection with an added 200% of battery life to their iPhone. PR: Marware Inc. has announced the SportShell Convertible for the iPod touch 2G is now shipping. With a detachable armband and belt clip, the SportShell Convertible is a cleverly designed 3-in-1 carrying solution. It is a tough hard shell case, an armband case, and a belt clip case that provides the freedom to take the iPod touch anywhere. 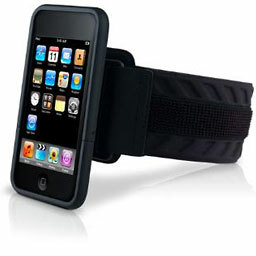 The armband allows the iPod touch to rest securely and comfortably on your arm while you go for a walk, jog or the gym. The sturdy belt clip locks in place and doubles as a stand. Remove the clip and the SportShell Convertible easily slips into a pocket, purse or bag. The SportShell Convertible also comes with Marware's Lifetime Warranty. 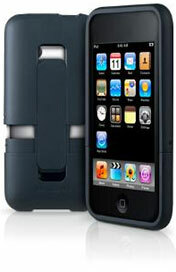 The SportShell Convertible for iPod touch 2G is available in black, retails for $39.99 and is shipping now. Visit Marware online for additional information. Marware is a leading provider of software and eco-consious accessory solutions for Apple iPhones, iPods, and notebooks. PR: Marware Inc. has announced the SportShell for iPod touch 2G is now shipping. The SportShell provides exceptional protection and a sleek look. This low-profile case offers three distinct carrying solutions, using a unique, patent-pending design. 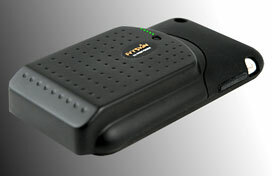 The SportShell easily changes from a belt clip case to an ultra-slim, flat-back or open-back case. The ratchet belt clip rotates a full 360-degrees, and doubles as a table top stand. The flat-back option is ideal when carrying the iPod touch 2G in a pocket or purse. The open-back option displays the iPod touch Apple logo. The SportShell comes with Marware's Lifetime Warranty. The SportShell is available in black, retails for $34.99, and is now shipping. Please visit Marware online for additional information. Marware is a leading provider of software and eco-conscious accessory solutions for Apple iPhones, iPods, and notebooks. PR: CAZE has released Zero 5 UltraThin case, claimed to be the World's Thinnest transparent case for iPhone 3GS/3G. Zero 5 is an enhanced version of the very favorable 0.7mm air jacket case. It has improved the thickness and the chrome edge protection. The case thickness was cut down from 0.7mm to 0.5mm and was extended to protect the chrome edges of an iPhone. It's available in clear and black and bundled with two screen protectors. 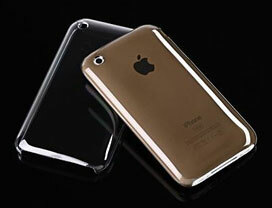 Zero 5 is currently the World's Thinnest transparent case for iPhone 3GS/3G, featuring a maximum thickness of 0.5mm. It's so thin and light weight, it's almost unnoticeable when installed. This ultra-thin case is especially suitable for users who wish to show the original iPhone outlook and shape while receiving the best protection. Zero 5 is purposely designed to increase the protection by extending the shell to wrap around the chrome edges and corners of an iPhone. Customers who buy any cases from CAZE will get a Mirror Screen Protector and an Anti-FingerPrint Screen Protector for free. iPhone CAZE designs and manufactures high quality, fashionable and unique iPhone cases for iPhone 3G/3GS in a wide assortment of styles and colors. iPhone CAZE offers a variety of cases of different materials from leather, metallic, fabric, silicone to swarovski crystal. Products will be shipped within 24 hours during weekday and 30 Days Money Back Guarantee is provided.